Learn all about the Python iterator, how they differ from iterables and generators, and how to build one yourself with __iter__, __next__ and itertools. Iterators are the omnipresent spirits of Python. They are everywhere and you must have come across them in some program or another. Iterators are objects that allow you to traverse through all the elements of a collection, regardless of its specific implementation. That means that, if you have ever used loops to iterate or run through the values in a container, you have used an iterator. First you'll see Iterators in detail to really understand what they are about and when you should use them. Then, you will see what Iterables are, since there is an important difference between the two! Next, you'll learn about Containers and how they use the concept of iterators. You will then see the Itertools Module in action. Finally, you will see Generators and learn about generator expressions, which is basically generator comprehension. Be sure to check out DataCamp's two-part Python Data Science ToolBox course. The second part will work you through iterators, loops and list comprehension. It is followed by a case study in which you will apply all of the techniques you learned in the course: part 1 and part 2 combined. An iterator is an object that implements the iterator protocol (don't panic!). An iterator protocol is nothing but a specific class in Python which further has the __next()__ method. Which means every time you ask for the next value, an iterator knows how to compute it. It keeps information about the current state of the iterable it is working on. The iterator calls the next value when you call next() on it. An object that uses the __next__() method is ultimately an iterator. Iterators help to produce cleaner looking code because they allows us to work with infinite sequences without having to reallocate resources for every possible sequence, thus also saving resource space. Python has several built-in objects, which implement the iterator protocol and you must have seen some of these before: lists, tuples, strings, dictionaries and even files. There are also many iterators in Python, all of the itertools functions return iterators. You will see what itertools are later on in this tutorial. 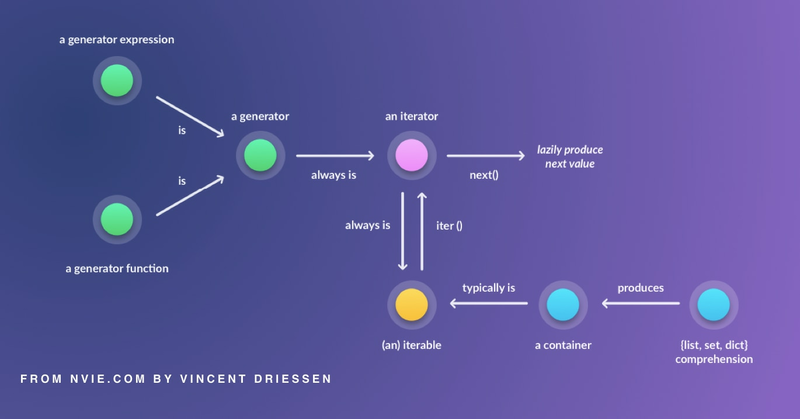 According to Vincent Driessen of nvie.com, "an iterable is any object, not necessarily a data structure that can return an iterator". Its main purpose is to return all of its elements. Iterables can represent finite as well as infinite source of data. An iterable will directly or indirectly define two methods: the __iter__() method, which must return the iterator object and the __next()__ method with the help of the iterator it calls. Note: Often the iterable classes will implement both __iter__() and __next__() in the same class, and have __iter__() return self, which makes the _iterable_ class both an iterable and its own iterator. It's perfectly fine to return a different object as the iterator, though. In the example, a_set is an iterable (a set) whereas b_iterator is an iterator. They are both different data types in Python. __iter__ returns the iterator object itself and the __next__ method returns the next value from the iterator. If there is no more items to return then it raises a StopIteration exception. It is perfectly fine if you cannot write the code for an iterator yourself at this moment, but it is important that you grasp the basic concept behind it. You will see generators later on in the tutorial, which is a much easier way of implementing iterators. Itertools is an built-in Python module that contains functions to create iterators for efficient looping. In short, it provides a lot of interesting tools to work with iterators! Some keep providing values for an infinite range, hence they should only be accessed by functions or loops that actually stop calling for more values eventually. You can learn more in depth about the itertools here. The generator is the elegant brother of iterator that allows you to write iterators like the one you saw earlier, but in a much easier syntax where you do not have to write classes with __iter__() and __next__() methods. The magic word with generators is yield. There is no return statement in the function series_generator. The return value of the function will actually be a generator. Inside the while loop when the execution reaches the yield statement, the value of low is returned and the generator state is suspended. During the second next call, the generator resumes from the value at which it stopped earlier and increases this value by one. It continues with the while loop and comes to the yield statement again. yield basically replaces the return statement of a function but rather provides a result to its caller without destroying local variables. Thus, in the next iteration, it can work on this local variable value again. So unlike a normal function that you have seen before, where on each call it starts with new set of variables - a generator will resume the execution where it was left off. Tip: lazy factory is a concept behind the generator and the iterator. Which means they are idle until you ask it for a value. Only when asked is when they get to work and produce a single value, after which it turns idle again. This is a good approach to work with lots of data. If you do not require all the data at once and hence no need to load all the data in the memory, you can use a generator or an iterator which will pass you each piece of data at a time. Generators can be of two different types in Python: generator functions and generator expressions. A generator function is a function where the keyword yield appears in the body. You have already seen an example of this with the series_generator function. Which means the appearance of the keyword yield is enough to make the function a generator function. The generator expressions are the generator equivalent of a list comprehension. They can be specially useful for a limited use case. Just like a list comprehension returns a list, a generator expressions will return a generator. The power of Generators is extreme. They are more memory and CPU efficient and allow you to write code with fewer intermediate variables and data structures. They usually require fewer lines of code and their usage makes the code easier to read and understand. That's why it's important that you try to use generators in your code as much as possible (Iterables vs. Iterators vs. Generators). Iterators are a powerful and useful tool in Python. However, not everyone is very familiar with the nitty-gritty details of it. Congrats on making it to the end of this tutorial! Head over to DataCamp's Intermediate Python for Data Science course. This tutorial works with matplotlib's functions that you can use to visualize real data. You will also learn about new data structures such as the dictionary and the Pandas DataFrame. You have already seen how iterator is used under the hood... head over to learn more about logic, control flow and loops in Python. This tutorial used the following as sources, check them out to learn more on iterators.